Pepsi Max Crew driver Greg Murphy has turned his day around to score a top 10 finish in the final race of the Trading Post Perth Challenge at Barbagallo Raceway in Western Australia today. The Kelly Racing Commodores battled with tyre wear all weekend, with Murphy only managing 24th place in his #11 Pepsi Max Commodore in today’s opening race. But after a big effort from his team, Murphy was able to bounce back in the final race of the weekend to score his third top 10 finish of the season with 10th place, the best finish from any of the team’s cars on Sunday. David Reynolds was lucky to avoid the stalled car of Karl Reindler at the start of this morning’s race, with Reindler’s car collected by Steve Owen at high speed triggering a fiery wreck. Both drivers emerged without serious injury. Reynolds suffered from poor tyre life aboard the #16 Stratco Commodore in both races today, posting finishes of 20th and 24th place in the two 50-lap races. Jason Bright and Jamie Whincup won the two races held at Barbagallo Raceway today. 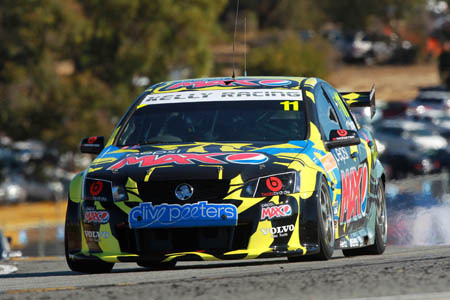 The next event of the 2011 V8 Supercars Championship will be held at Winton Motor Raceway in rural Victoria on May 20-22. “It was a very tough weekend for everybody in the team,” said Greg Murphy. “This place is notorious for low grip and for making you feel like crap at the end of a weekend if you don’t get the car set-up right. “We were all over the place this weekend. Yesterday wasn’t too bad from a poor start to the day with our qualifying position on the hard tyres. “Today in qualifying one grid spot was good but the other one was poor. The first race on Sunday was just awful for us. We had bent steering but the way we went with the set-up also destroyed the car’s tyres so quickly I was a lap down at the finish and that’s embarrassing. “To turn that around and get the Pepsi Max car to finish 10th and show a lot of promise makes me happier for sure. “It was a great job by Barry (Ryan) my engineer and all the guys working on my car. People have got to understand how much work my guys have done this weekend. “The work that they did to my car between the two races today was in very short gap between races was amazing. They turned the car around and look how good it was in that last race. “I’m really proud of what they did. At least it does give us a direction for this type of circuit and we have a few of these very low grip surface circuits to go this year. “It was not the best of weekends in terms of car speed for our Stratco Commodore,” said David Reynolds. “We tried some stuff on our car in the last race and we hurt our tyres badly. “It was good to see Murph do a good job in the last race so that he finished on a high. “I probably had the worst race I’ve ever had in my whole life but hey, you need to try stuff and we can learn from the things Murph did to his car. “It was a very quick reaction time from me because I only saw the stalled car at the last millisecond,” said David Reynolds. “It saved the team the car. There was nothing I could do except turn hard, hard right and hope for the best. “The car was not fast enough on Friday when we rolled it out of the truck and traditionally this year we have been able to turn that around,” said Rick Kelly. “Unfortunately this weekend we didn’t manage to do that. “The #15 Jack Daniel’s Commodore didn’t look after its tyres very well at all. We managed to qualify reasonably both days and it just fell back from there. “The frustrating thing is we went slightly in one direction in set-up in that last race and it was a lot better. “We now know which way we need to go with the car. Unfortunately it’s three days too late. “It’s disappointing from the results point of view for us but we have to put that down to a bad round. If this is a bad round for us then that is not too bad. We certainly don’t want to have these sort of weekends but they do happen. “We know what to do here next year set-up-wise and we head to the next event trying very hard to get back up the front. “It’s critical to still score solid points when you are not having the best weekend. When others have a bad round, hopefully they are a little further back than what we were here. “We didn’t have a car that was capable of being in the top six or so. To finish around the ninth to 12th mark is probably not too bad for us considering. “We did score some points and some others that are around us in the championship points had good rounds and others had bad rounds, so I don’t think we finished too badly given the car speed we had. “I was a bit deflated after the last couple of days going into the last race,” said Todd Kelly. “We were scratching our heads in terms of what we were doing wrong. We made some pretty big changes to my Jack Daniel’s Commodore for the last race and it was the best it has been by a long way in that race. “There are a couple of corners where I swear I was going quicker on old tyres in the last race than what I did in qualifying on new ones. “The difference was massive. We worked it out and it was all a little bit too late. “If I had that set-up earlier in the weekend I think we were capable of a top 10. Once we qualified poorly the traffic meant it was very hard to get back up there, even with the improved car speed. “At least we worked it out. After the different range of tracks we have this year we have a lot broader idea on what we need to do with the cars.